Dr. Brian Haas and Boutique Eye Orlando love Halloween! Don’t be surprised to see your favorite Orlando eye doctor wearing a costume on Halloween. But while Halloween means candy and cooler weather, we want to talk a little about eye safety so you can enjoy your Orlando trick-or-treat fest. Contact Lenses– Everyone loves those funky colored and weird shaped contact lenses. But PLEASE do not buy them online or from some random store. Not only is it illegal, it is dangerous! Our optometrist, Dr. Nguyen can fit you with cosmetic contact lenses. They need to be measured and the right shape and fit for your eye. Improper use of cosmetic contact lenses can result in serious eye infections, pain, or even blindness. Some contacts imported into the USA are made with dangerous materials. Luckily there are legitimate cosmetic contact lenses that are fun and safe. But they must be prescribed by your eye doctor. Contact our office for an appointment with Dr. Nguyen. Make-up– Try to use hypoallergenic makeup. Check the ingredients, especially when using around the eye. Some Halloween make-up can irritate the eyes. try and keep all makeup away from the water line/eyelashes. Pointy Props- Avoid pointy props with young children. Plastic arrows and spears might be fun, until you get hit in the eye with them. Avoid anything too sharp, this goes for facemasks too. Costumes That Block Vision– Make sure that your costume allows good vision. Wigs, facemasks, and hoods can block peripheral vision that can make it hard to see cars. Flashlights– Use a flash light or other illuminating device so that you can clearly see where you are going. It’s easy to trip over rocks or uneven sidewalks when it’s dark out. Be Seen– Make sure other people can see you! Wear reflective clothing, glow sticks, and flashlights so drivers can see you. Light color choices help too. 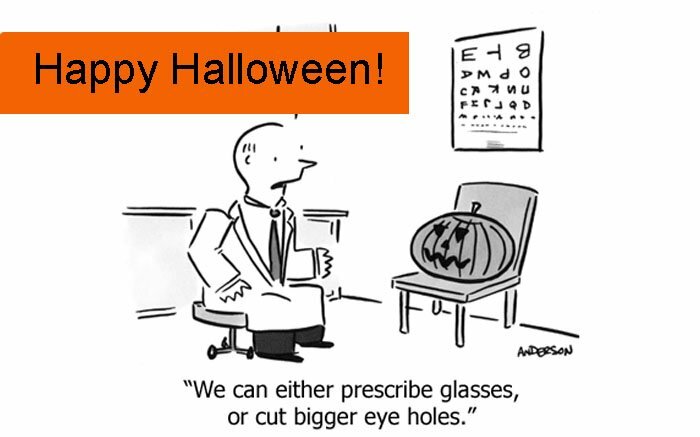 Have a happy and safe Halloween from Dr. Brian Haas and everyone at Boutique Eye Orlando!